Click here for American Fork, Utah, Video.January 26, 2011, between 7:15 PM - 7:30 PM Mountain. Video © 2011 by JohnJayandKinna. Image © 2011 by Jessica Fawson. February 8, 2011 Albuquerque, New Mexico - On January 29, 2011, I reported at Earthfiles about several viewer reports of strange, loud, booms heard in many states and even in The Netherlands since December 2010. 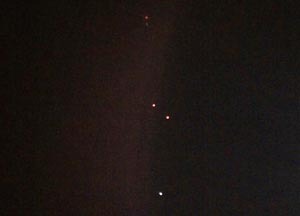 On Wednesday, January 26, came news and videos of red, glowing, unidentified aerial lights dropping “white orbs” or sparkling, silver-white material over American Fork, Utah, south of Salt Lake City, between 7:15 PM and 7:30 PM. The following are some of the emails I have received from Earthfiles viewers since those reports.